Headline indices of the Hong Kong share market were down for fourth straight session on Friday, 20 July 2018,as risk aversion selloff continued on tracking weak cues from Wall Street overnight amid U.S. President Donald Trump's criticism of the Federal Reserve and as an extended decline in the Chinese yuan rekindled worries about the stability of the Chinese economy which faces rising risks from a major trade conflict with the United States. At midday break, the Hang Seng Index fell 152.63 points or 0.54% to 27,858.23. 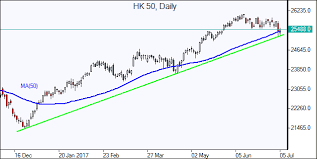 The Hang Seng China Enterprises Index slipped 37.56 points or 0.36% to 10,485.68. The US President Donald Trump on Thursday criticized Fed policy and expressed concern about the potential impact of rising rates and a stronger dollar on the U.S. economy and American corporate competitiveness. China's central bank lowered its midpoint for the yuan for the seventh straight trading day and to its lowest in a year. The People's Bank of China set the official mid-point at 6.7671 before the market open, the weakest fixing in a year. With China showing little signs of arresting its currency's depreciation, the yuan promptly retreated to a near 13-month low. There are several channels through which the yuan's weakening is hitting Asian market. First, a weaker yuan challenges the competitiveness of other Asian economies. Second, the weaker currency also causes fears of capital leaving China and disrupting their capital markets, which could have knock-on effects on Asia. Lastly, a weaker yuan deepens trade war concerns. The yuan hit its lowest level in a year on Thursday, and down nearly 8% over the past three months amid a global trade spat and concerns over an economic slowdown in China. The yuan's latest dip came after China's central bank indicated that it was willing to accept a weaker currency. A sliding currency could help China's huge export industry cope with new US tariffs, as it makes Chinese products cheaper for buyers who pay in dollars. That could in turn boost an economy that posted its slowest growth rate in nearly two years — 6.7% — in the second quarter. Unlike the dollar or euro, the yuan does not float freely against other currencies. Instead, China's central bank helps guide the currency by setting a daily trading range. On Thursday, it surprised investors by guiding the yuan lower. Corporate news byte:- Binhai Investment (02886) expects the profit to decrease by 60% for the six months ended June 2018 as compared to that for the corresponding period in 2017, citing such significant decrease was mainly due to an increase in foreign exchange losses of HK$68 million resulting from the depreciation of Renminbi and an increase in finance costs of the group of HK$62 million. China Unicom (00762) said the aggregate number of mobile billing subscribers in June amounted to 302.018 million. Net addition for the month was 2.584 million. Of which, the total number of 4G subscribers was 203.109 million. Net addition of 4G subscribers for the month was 2.775 million, compared to May's 2.07 million. As for fixed-line business, the total number of fixed-line broadband subscribers was 78.916 million. Net reduction for the month was 0.231 million. China Power Clean Energy Development (00735) combined total power generation of the group from 1 January to 30 June of 2018 was about 5.03 million MWh, an increase of 7.95% when compared to the same period of 2017. The increase in the company's total power generation when compared to the same period of last year was mainly attributable to the improvement in situation of photovoltaic power curtailment; the enhancement in situation of wind power curtailment; and the increase of various renewable energy projects. ECONOMIC NEWS:- The seasonally adjusted unemployment rate stood at 2.8% in April to June 2018, same as that in March to May 2018, according to the provisional figures for April to June 2018 released by the Census and Statistics Department (C&SD). OFFSHORE MARKET NEWS: US stock market closed down on Thursday, due to negative reaction to disappointing earnings news from several big-name companies.  The Dow slid 134.79 points or 0.5% to 25,064.50, the Nasdaq fell 29.15 points or 0.4% to 7,825.30 and the S&P 500 dropped 11.13 points or 0.4% to 2,804.49. The major European markets closed mixed on Thursday. The U.K.'s FTSE 100 Index inched up by 0.1%, while the French CAC 40 Index and the German DAX Index both slid by 0.6%. COMMODITY NEWS: Crude oil prices were mixed on Thursday. The Brent crude oil price dropped on rising oversupply concerns and US dollar strength. But Saudi Arabia's OPEC Governor Adeeb Al-Aama said that crude oil exports would fall by around 100,000 barrels per day in August to limit excess production. Brent crude fell by US32 cents or 0.4% to US$72.58 a barrel, but the US Nymex rose by US70 cents or 1% to US$69.46 a barrel. Base metal prices were down on the London Metal Exchange (LME) on Thursday. Copper (-1.4%) fell below US$6,000 a tonne during the trading session for the first time in 12 months as the US dollar strengthened and concerns over the impact of tariffs on global growth re-intensified. Tin rose by just 0.1%.